8/18/13 Shop Update at 7CDT! It's that time again! Shop Update at 7 p.m. CDT tonight. Here's a little preview! 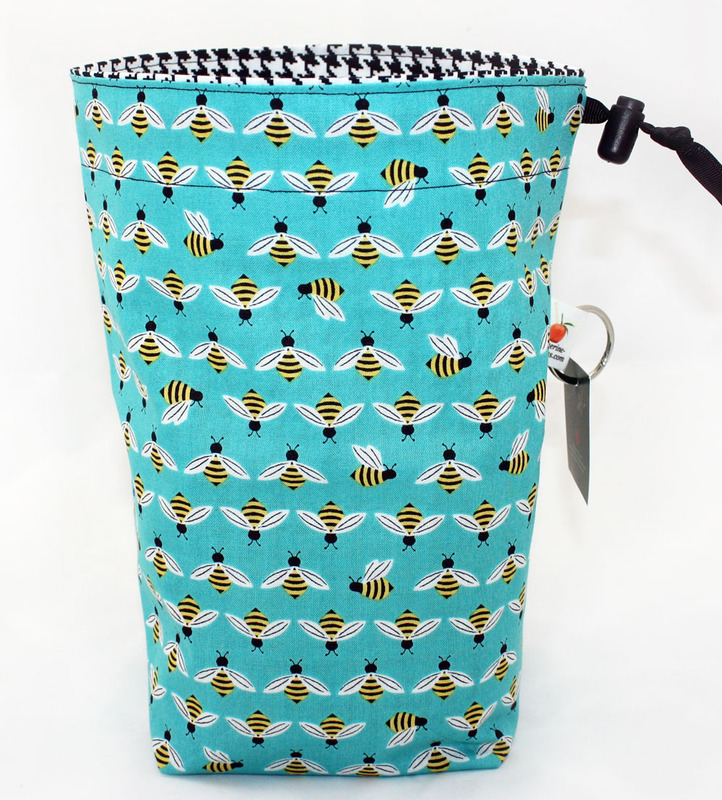 Bees Please, Butterfly Wheel Tool Bag, Steampunk Octopi, Kicks, Poison Wheel Tool Bag, Children at Play Wheel Tool Bag, Fall Y'all, Pigeon Dreams, and Monkeys. I'm also adding the Back Up Off My Stash pinback buttons and magnets along with some Blue Yarn Box magnets. Update today, Sunday, August 4, at 4 CDT! It will be a restocking of some fabrics from the last update. With us here at Tangerine Designs headquarters getting ready for school to start, the next update will be Sunday, August 18. I will have a whole week of children in school to sew for your next update! At least that's how it happens in my imagination! I just got back from my first ever fiber event, SSK (Super Summer Knitogether), this past Sunday. It was more fun than I could ever imagine. Not only were people awesome, but we all had a common interest! I got to eat breakfast and lunch in a place reminiscent of Harry Potter, and have dinner with different groups every night. Also, my classes were so informative. I took Finishing with Amy Christoffers of Savory Knitting where I learned the ins and outs of finishing a sweater. Best tip: do a yarnover in your swatch and take it to the store with you to pick out buttons. Genius! My other class was with Susan B. Anderson on Fair-Isle hat knitting, and I was very apprehensive of knitting with one strand in each hand. But I have now learned how to continental knit, and I'm so glad I have! Also, her book, Itty Bitty Hats, was the very first knitting book I bought. So, I was a little nervous meeting her! She was the most patient, sweetest person putting up with my nervous energy! And did I tell you about the market?! Fantastic! Everyone showed up in droves to support all of us vendors, and it was amazing getting to see customers in person! I also had some of the best helpers: Mel from Single Handed Knits and Susan from Girl Cave Bags. Both of whom gave their time willingly and cheerfully. And all of it wouldn't have made it out of the ether without Leslie and Laura of The Knit Girllls. I'd like to say thanks to them and all their helpers for all the fun, new friends, and learning experience that they've brought to my life! Here's hoping for SSK 2014! 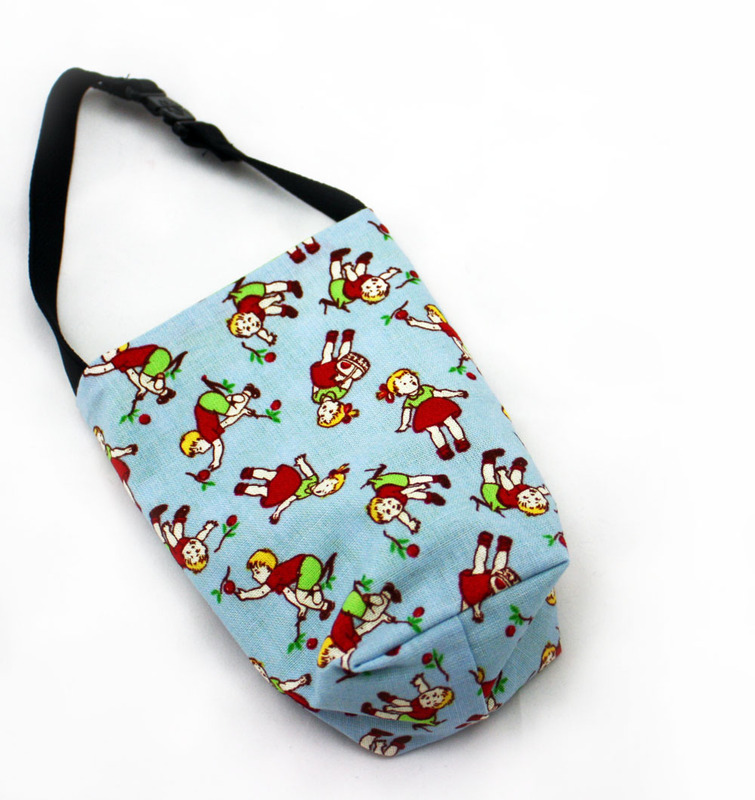 Also, for those attendees and market-goers that didn't get an opportunity to buy the special regular size SSK project bag, I'll be putting around 20 preorders up in the shop on Saturday night, 7/27/13, at 9 p.m. CDT. The lining fabric will be at my discretion, but the outer fabric will remain the same. The latest they will ship is the end of August. I will ship International orders first then the remaining in the order they were placed. 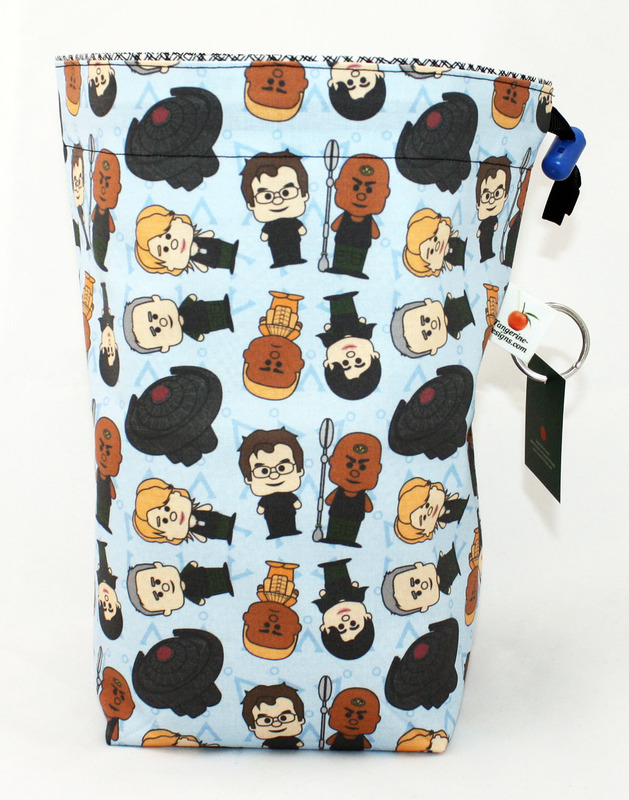 Please order this item separately from any others, or I will not ship your other items until your bag is made. As with the ones sold at the retreat, a portion of the proceeds will be given to the Scarritt Bennett Center. This past week has been a marathon trying to make sure I have everything ready for SSK (Super Summer Knitogether) Market! As some of you may know, this is my first time vending a fiber-centric event! Not knowing what to expect has lead me to, hopefully, over prepare. 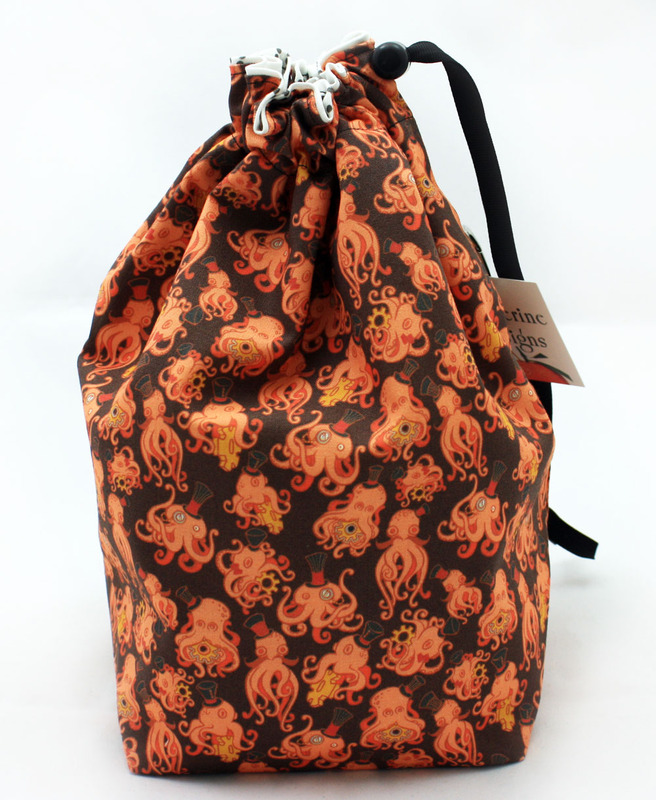 I'll have sweater bags, regular size project bags, notions bags, wheel bags, buttons, keychains, gauges, mustaches, tags, and a couple new things that haven't made it into the shop yet. Below are pictures from my week including booth prep and spray painting. Click on any picture to get a better look. 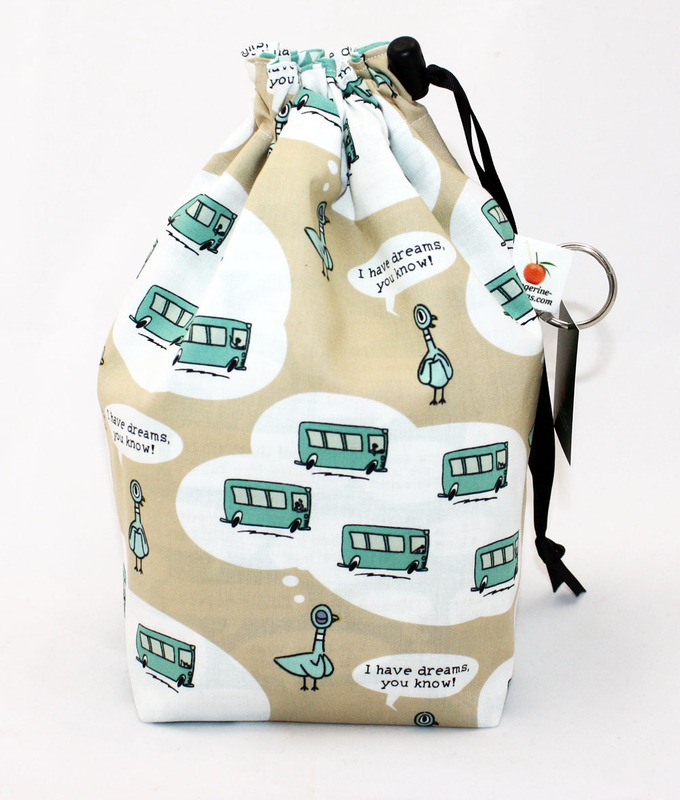 If you are attending the retreat, I'll have Tangerine Designs Bag Lady and Bag Fella mini buttons to give out. If you'd like one, just come up and ask! 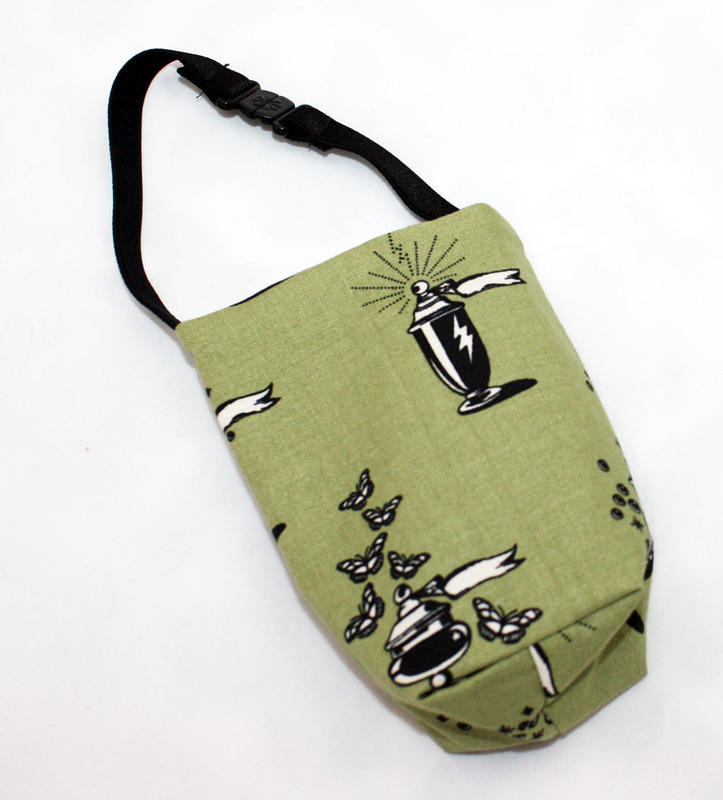 Also, I will have a limited number of SSK fabric bags for sale. I will also take a limited number of preorders for these at the show. Just pay at checkout with your other items! I'll ship them out, which can take up to a couple months, in the order I take the preorders. The lining will be subject to change, but it will coordinate with the specialty SSK fabric designed by Beck Gusler of Gusler Design. 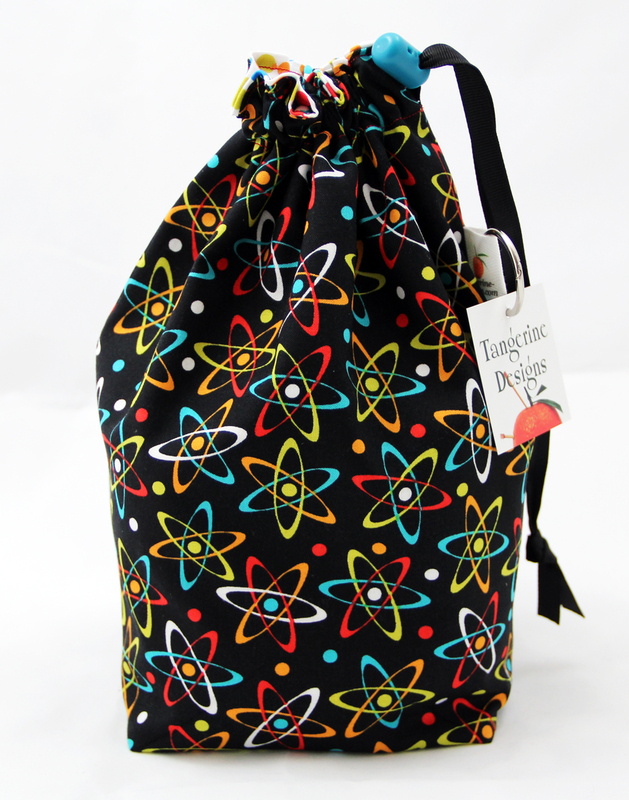 A portion of sales of these bags, at the show and preorder, will be going to the Scarritt Bennett programs for women. For those not attending, I'll be closing the shop down today, Sunday, after lunch and will reopen the week after SSK (sometime after 7/21). There should be plenty of goodies left that will go up! I'll give you a heads up on social media before it goes live. I look forward to meeting tons of awesome people at the retreat, and hopefully get all my languishing socks finished! Just added to the Shop is the brand new Attitude tags! These are not your everyday sweet gift tags. They're for those of us that sometimes may have a little too much attitude. 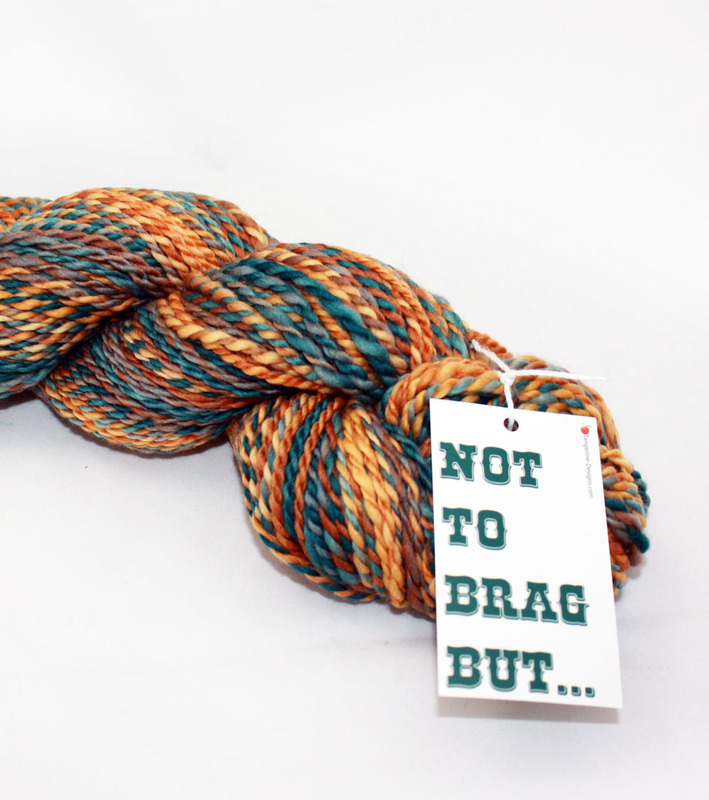 Use them for your handmade gifts; or, as I did, for your handspun. 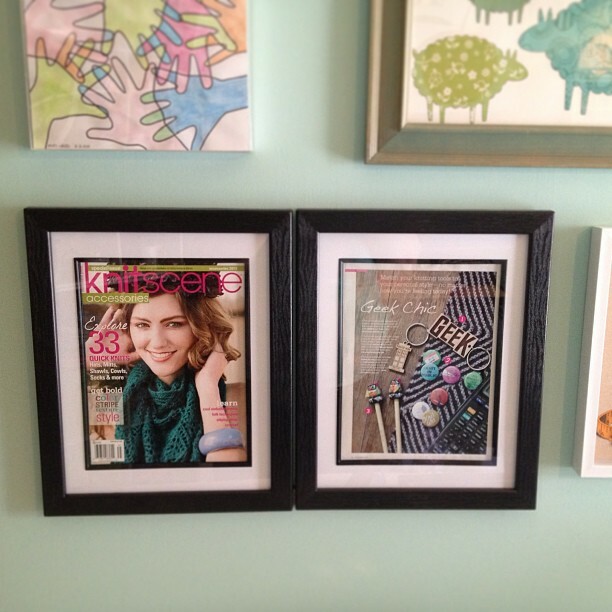 Also, Tangerine Designs has been featured in the special issue of Knitscene Accessories 2013, on newsstands now (and on my workroom wall!). To commemorate this exciting news, I'm going to be giving away a copy of the magazine and a set of the new Attitude tags. To win, comment here on Ravelry with something exciting in your life! Must be a member of the Ravelry group to win! I will draw a winner on Friday, June 21 at noon CDT. 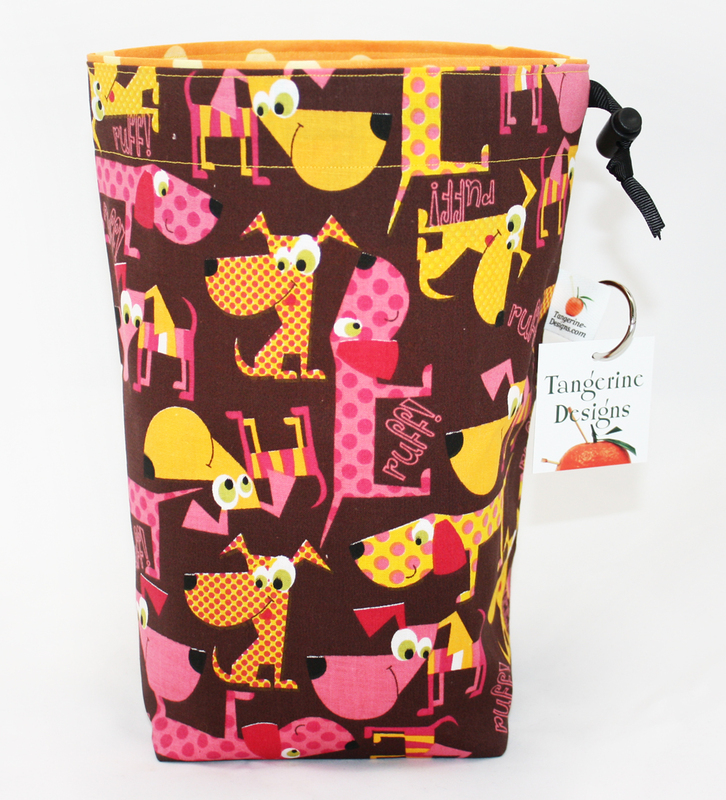 There's been a lot going on at Tangerine Designs headquarters this month! First of all, I've been on a sewing marathon. In addition to updates, I'm preparing backstock for SSK, hosted by The Knit Girllls. SSK (Super Summer Knitogether) is a knitting retreat held in Nashville, TN. The market, in which I'll be vending, will be open to the public on Saturday, July 20, from 1-4. So, if you are in the area, please stop by! During this sewing spree, I've added eight new designs: Pigeon Dreams, Pigeon Run, My Mustache!, Ray Gun, Mike Teevee, Put Your Records On, Stargate SG-1, and To Boldly Go. There will be at least one of each in this week's Shop Update, June 9 at 7 p.m. CDT. In addition to the new bags, I'll be adding some new paper tags on Sunday. Hand Knit with Love tags will come in sets of 5. They have an added bonus of check boxes on the back for laundering care. There'll be another style available soon. WIP to Finished Object tags are made for putting on the ring of your Tangerine Designs bags. 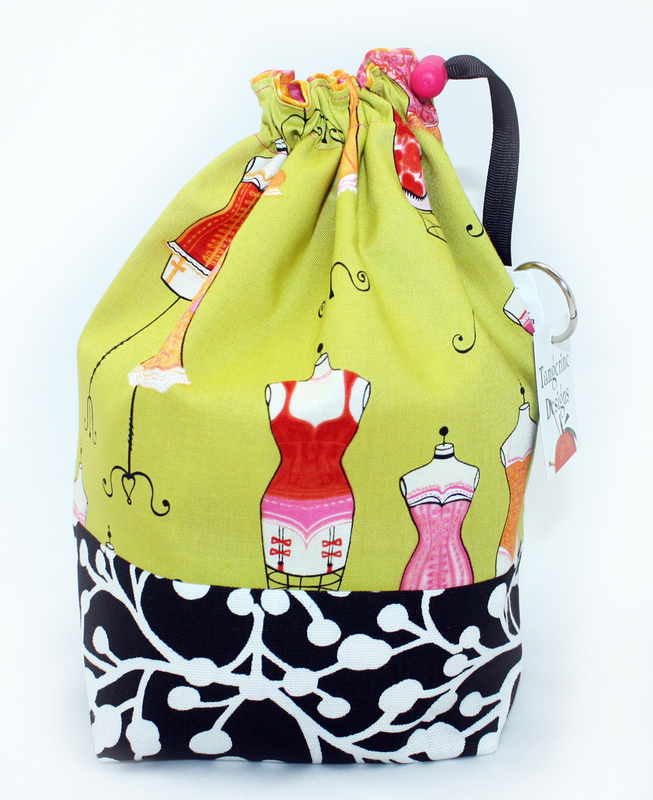 Keep track of what project is in your bag, and never have the problem of wondering what pattern or yarn you were using. 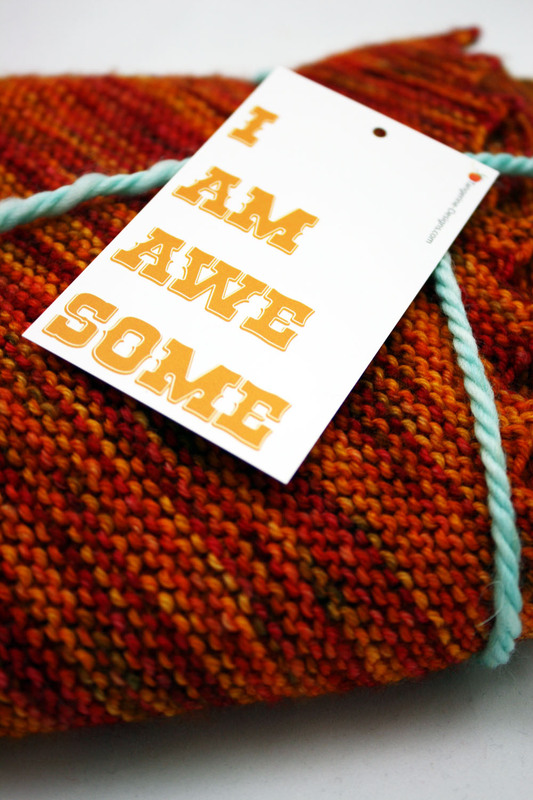 When done with your project, you can cross out the WIP and use the tag for journaling your knits. 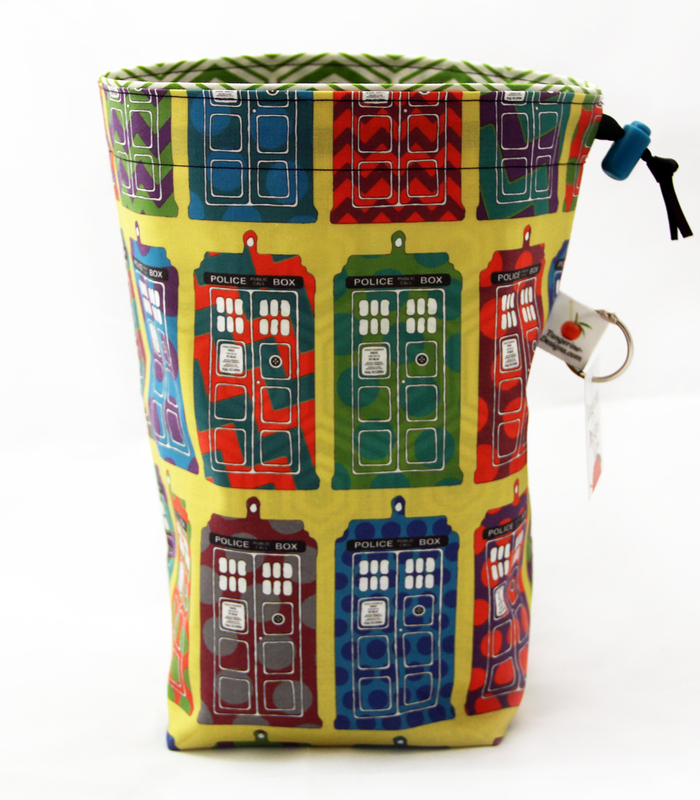 You can also punch an extra hole, add a sample of the yarn you used, and keep on a book ring. I'll be adding one of these tags to each project bag purchased. 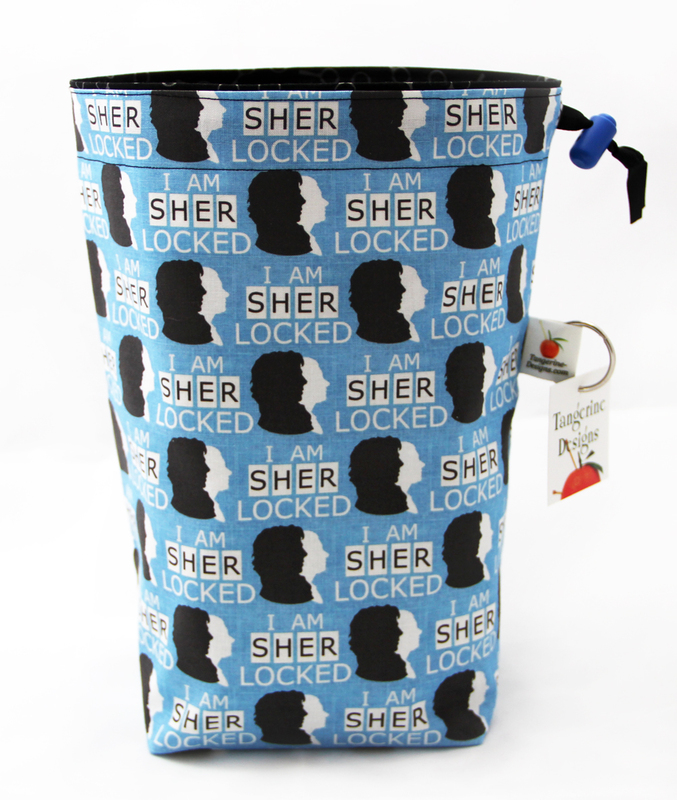 I'll have Starter Kits (5 tags and a book ring) and refills (5 tags) available in the shop at update time on Sunday. Just as a reminder, Knit In Public week starts Saturday, June 8th. So, get out there and scare some Muggles! 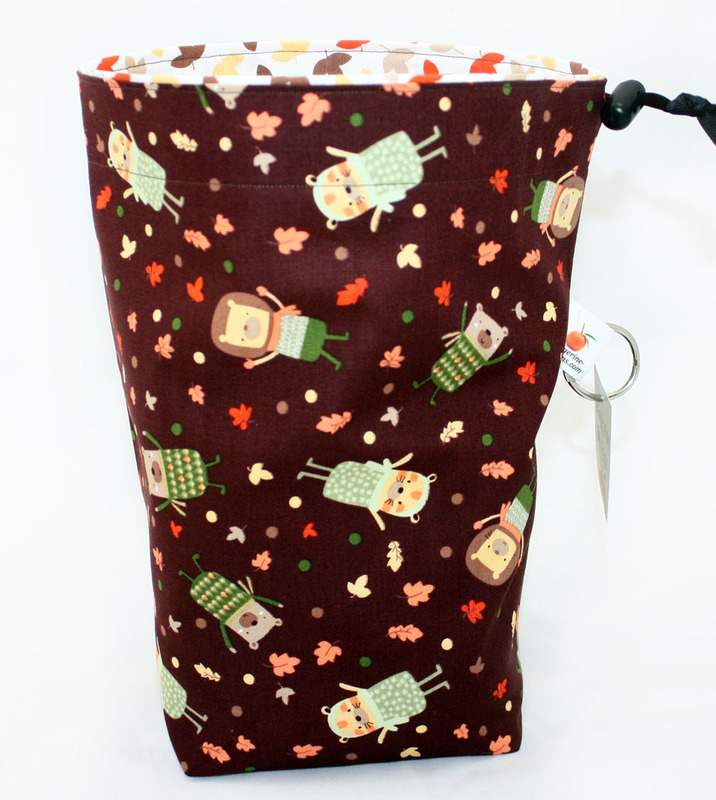 If you do KIP with your Tangerine Designs bag, I'd love to see a picture in the Ravelry Group! 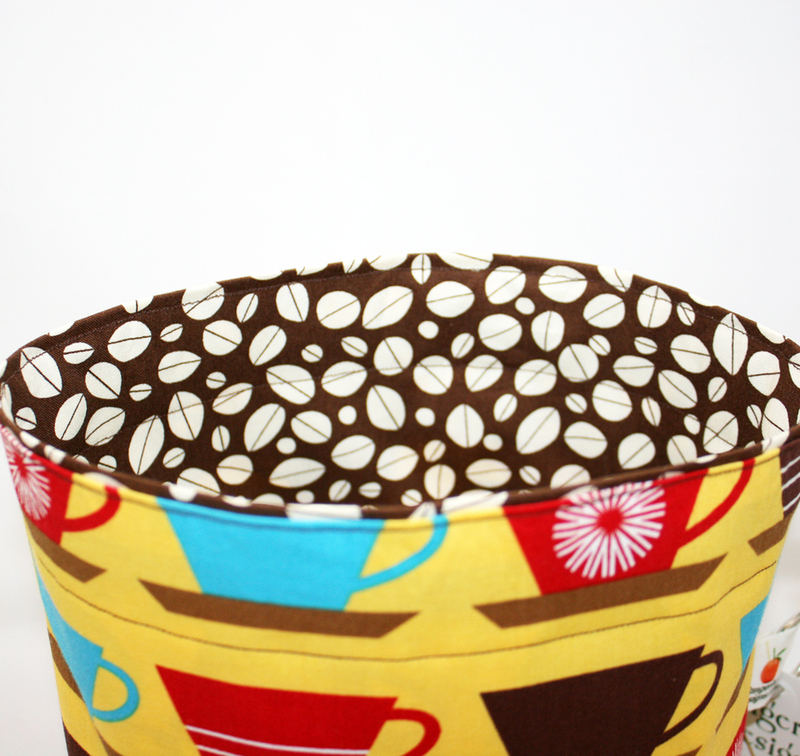 Today's Shop Update will be a little later in the day, 7 p.m. CDT instead of the usual 4. You might wonder why? Well, it's because Star Trek: Into Darkness will be getting in the way. Today I've persuaded a lovely friend to watch my two beautiful angels (hopefully) so my husband and I can watch it together. So, even though y'all are important to me, Star Trek must come first! In today's update, there will be at least one of the following: Sea Fun (organic cotton), Big Bang, Russian Dolls, Totally 80s, Dress Forms, A Pup Named Dot, I Am Sherlocked, Storm Troopers, and That 70s Box. To get a larger view of any of the pictures, just click on it. I'm on vacation! I'm meeting up with some extended family at the beach. For a midwestern gal, this is very exciting! So, you'll probably see tons of pictures popping up on Instagram and Twitter. Today in the mail, my daughters and I got a fabulous gift. The super wonderful Mel of Single Handed Knits sent us some fabric from her scenic home in Hawaii. And this on its own would be special, but this is the second time we've gotten such a wonderful gift from her. The first time she sent this gorgeous purple fabric with white and gold flowers. It took me weeks to get to it. Admittedly, I was waiting for the perfect thing to make. So, when I found Girl's World: Twenty-One Sewing Projects to Make for Little Girls in my local bookstore, I got started right away. The girls will look fantastic in these little dresses when we go on our beach vacation. Mya so happy she can't stand still for the pic. So, today when Annaka opened our package and there was more Hawaiian fabric, we were ecstatic about the possibilities! Annaka soon decided that her and her sister needed pillowcases for our soon to take car trip to Gulf Shores, Alabama. I got right to work! You would think that since I sew for a good part of my job that I would know how to sew pillowcases. Nope! This is where the Great and All Powerful Google-Moogley comes in. I found this great tutorial from TheCraftyGemini Here. I followed it faithfully except I had to make the cuff a little bigger because I was short just a few inches of the fancy fabric. I added a blue and white accent to Annaka's (her favorite colors are orange and blue), and a pink accent for Mya (because she's a girlie girl and loves pink). I even learned to be fancy and make French seams! Mya even had an active hand in helping sew these new treasures. She likes to push the buttons on the machine and help take out the pins. Don't worry. The machine was stopped every time she took out a pin. It makes the sewing go slower, but it's worth the look of accomplishment on her face. So, from the time of opening the package from dear Mel and finishing, it took a whole 3 hours! I would highly recommend making some of these, especially if you're a beginner. Just look at those happy, goofy faces! Again, Mahalo to you, Mel. Now, the girls will be taking some Aloha with them on vacation! 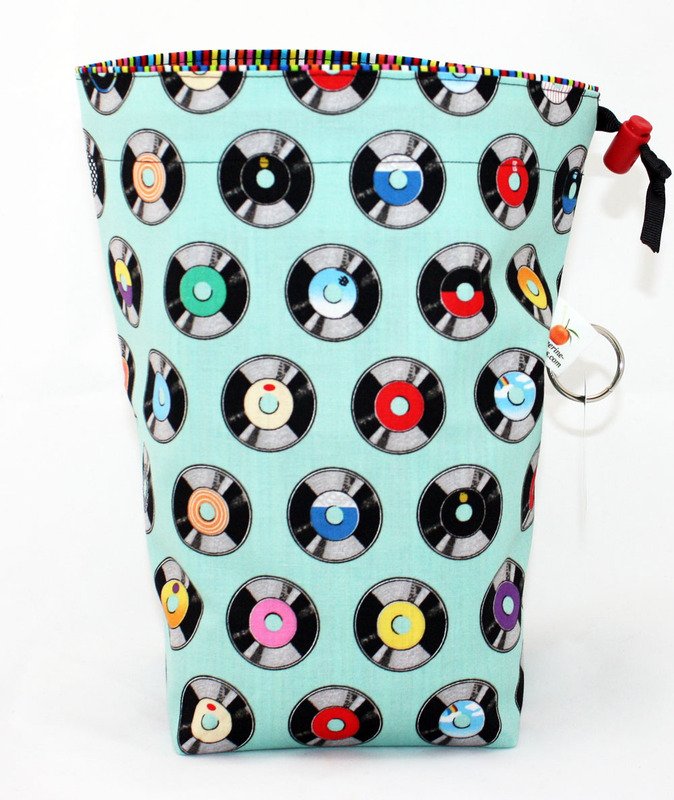 This Cinco de Mayo stop by Tangerine Designs at 4 CDT and get a project bag or two. There'll still be plenty of time to go to your favorite Mexican Restaurant, have a couple of enchiladas, and, if so inclined, have a cerveza or margarita. This update will be all about the regular project bags. There will be at least two of the following: Over the Rainbow, A Pup Named Dot, We Are Made Of Stars, Dress Forms, and Annaka's Art. There will also be two Crossword Dots. 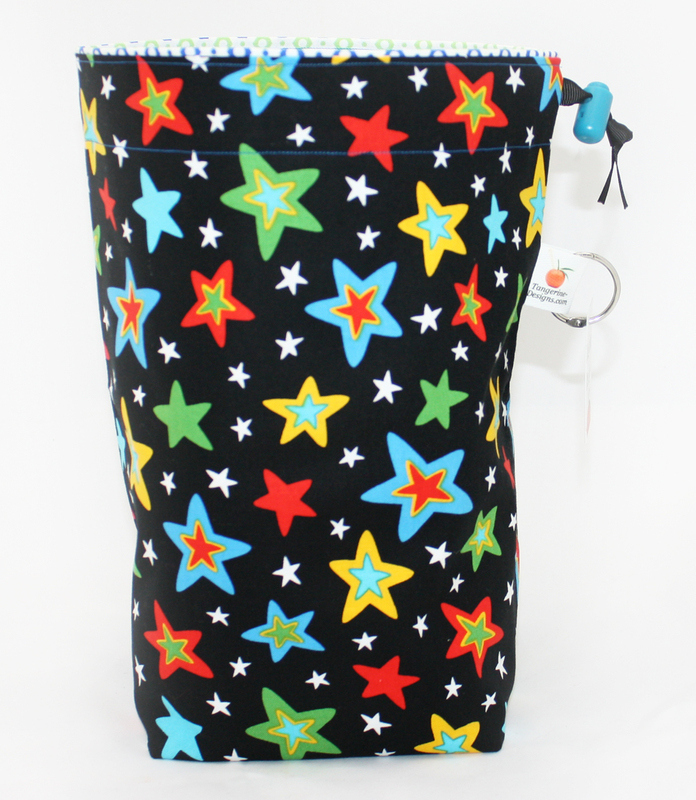 This bag is fully reversible. One supply clip can be used either on the inside or the outside. The inside tab can also be used to slip circular needles through to help projects from slipping off the needles, or to use as a yarn guide. The last picture is a representative picture of this. Also, already listed in the shop are some new pinback buttons. 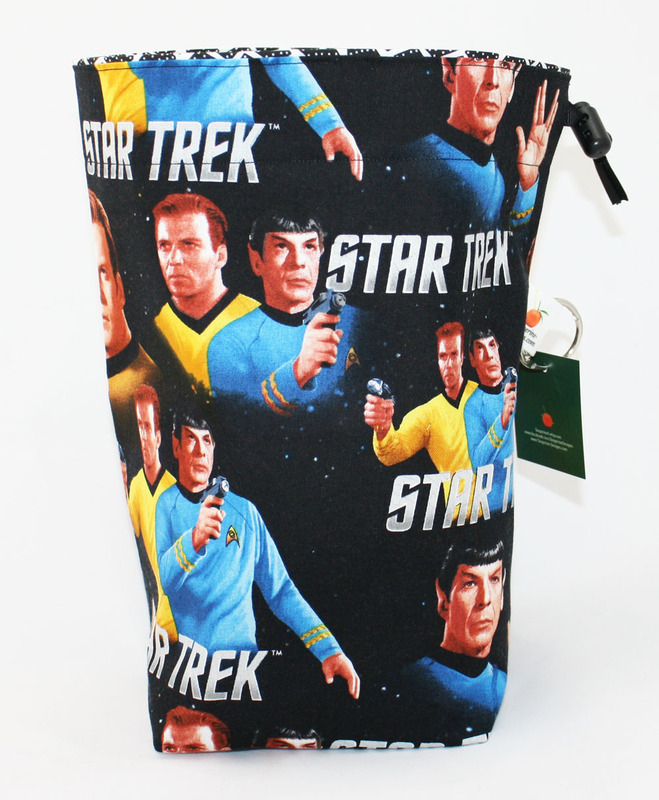 Being a huge Star Trek fan, I just couldn't stand not having more Trek represented in the shop. 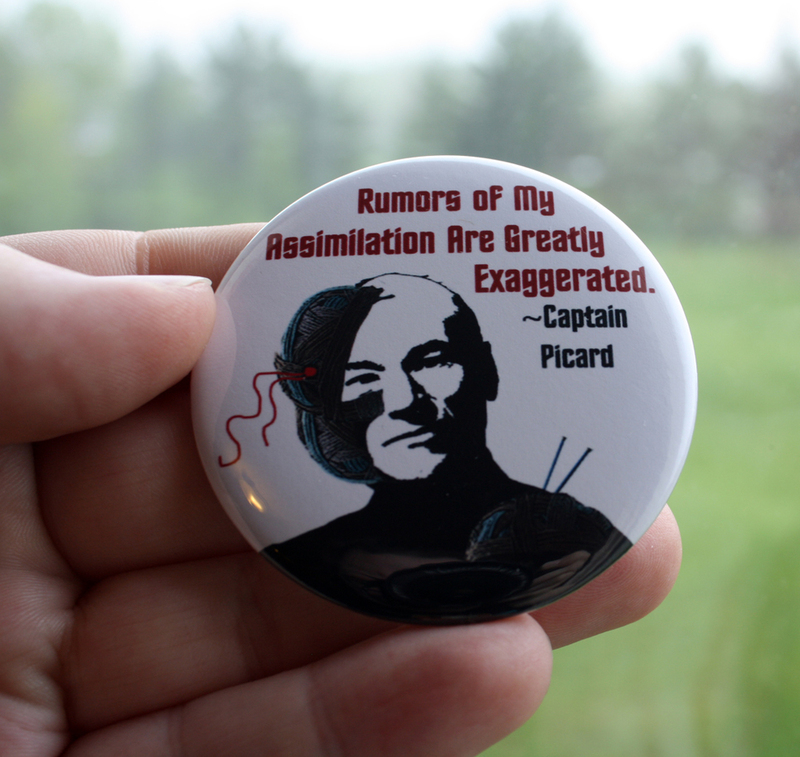 My favorite captain, Captain Picard says, "Rumors of My Assimilation Are Greatly Exaggerated," and the ever evil Borg Queen says, "We Will Add Your STASH To Our Own." Both with yarn and knitting needles. There are two sizes available, a 1.5 and a 2.25 inch button. So be careful when ordering. This will be the last update until Sunday, May 26, unless I add a weekday update, because I will be on our family vacation from May 9-19. I won't be closing the shop down during those dates, but please understand that all orders placed during that time frame will not be shipped until May 20. Thank you!